Let your friends guess, share this picture! Welcome to my video course “250 Dutch Proverbs”. I made a selection of proverbs and sayings that anyone who learns Dutch should know. The course consists of 25 lessons. In each lesson, I explain the meaning of 10 proverbs or sayings.Subtitles are available for each lesson. You just push the CC button in YouTube. The transcript of the lesson you find on Learndutch.org. And here you see the drawing of today, made by Dutch learner and graphics designer Kata from Hungary. It represents 1 of the 10 proverbs of this video. By the end of the lesson, I show you the drawing again. Your task to guess which proverb it is. Let’s start with lesson 22, containing proverbs 211-220. Literally: putting paste on it and keeping it wet. The expression is used, when a rigorous approach to solve the problem is avoided. Instead, some minor measures are taken in order not to let the situation get worse. The origin of this expression is a medical treatment, where a doctor prescribed paste to put on the skin; in a situation where surgery would have been another option. Here the word “nat”, which usually is translated as “wet”, has the meaning of liquid food. So the literal translation would be; it is all one pot of liquid food. The meaning is that it is all the same. It all comes from the same pot. You can use it in a situation when someone is comparing opponents and concludes that they are actually all the same (not in a positive sense). For example, you have a political discussion, comparing the views of one political party with another. And then someone in the discussion says; these politicians are there only for themselves. “Het is één pot nat”. Literally: behind one’s back. Same as in English: when two people do something or say something a third person doesn’t know about. You use the expression in a situation, which is considered unfair. Literally: to beat a salad out of it. The expression is used when one tries to use a specific situation to get an extra benefit. Mostly, it is not a positive judgement and used when a certain way of earning money is morally unacceptable. For example, there is a train disruption and no trains go to the airport and cab drivers come to the railway station and offer a ride at rocket prices. Literally: to be a buyer of bacon. You can say about someone who made a very good deal. The origin of this expression is the time that bacon was very expensive, so only those who had much money could afford to buy bacon. Literally: not to hide it under chairs or couches. The expression is used when someone shares publicly some information (about himself) that others maybe would hide. It could be in the case when someone is not ashamed, but also when someone is not modest. It is especially frequently used when someone explicitly announces his ambitions. For example: hij stak niet onder stoelen of banken dat hij minister wilde worden. A violin bow is called in Dutch “strijkstok”. However, and most Dutch don’t know that, this is not the origin of this proverb. It is actually a stick, which was used as a ruler to wipe away the extra grains in a measuring jug. So the literal translation says, that this ruler took away too much. You use the proverb when a relatively small part of the finance reaches its final destination; for example when the overhead costs are too high, or when affiliates take high commissions. The expression is used frequently when talking about the inefficiency of charity funds. A “stuiver”, used to be the 5 cents coin in the time before the euro, when we had the Dutch guilder. So the literal translation is: exchanging 5-cent coins. It is used to express position changes, when people take each other’s position. It can refer to sports rankings but also to job rotations. For example, if the vice-chairman becomes the chairman and the chairman becomes the vice chairman. Literally: the best helmsmen stand on the shore. You use the proverb when someone who is not in charge of the job, thinks to know better how the job should be done. As long as he does not need to prove he can do it well, it is very easily for him act like he’s an expert. Literally: to lift the tip of the veil. The “sluier” is the part of clothing that covers the face (usually: of women). The expression is used, when someone unveils to fans or users some first information, about an upcoming event, performance or product. For example, the author is writing a new book. By telling where the book will be situated, he lifts the tip of the veil. Hij licht een tipje van de sluier op. Here you see Kata’s drawing again. It is one of the proverbs of this lesson. I hope you are able to determine which proverb is represented here. And just a small hint – you don’t need your longterm memory. If you, just like Kata, are also a creative person, and you want to show your skills to the audience of learndutch.org. Feel free to contact me with your ideas ! So, that’s it for today. Again you know 10 more Dutch proverbs. Continue, and finish this course, and you will be a buyer of bacon, and no reason to hide that under chairs or couches! Do not forget to share this video on social media, and to put thumbs up in YouTube. 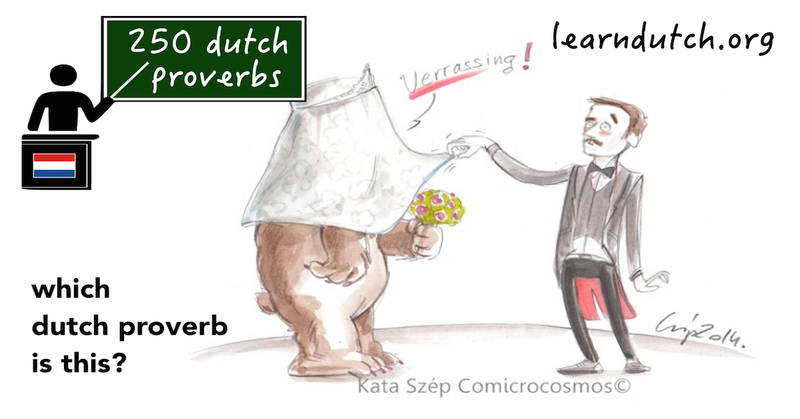 See you back in lesson 23 of 250 Dutch Proverbs. You can always reset the cookies, using the button in the footer.